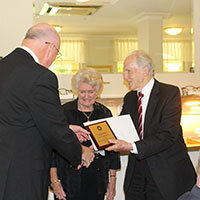 Archbishop Hart presents Ron and Mavis Pirola with their plaque of appreciation. 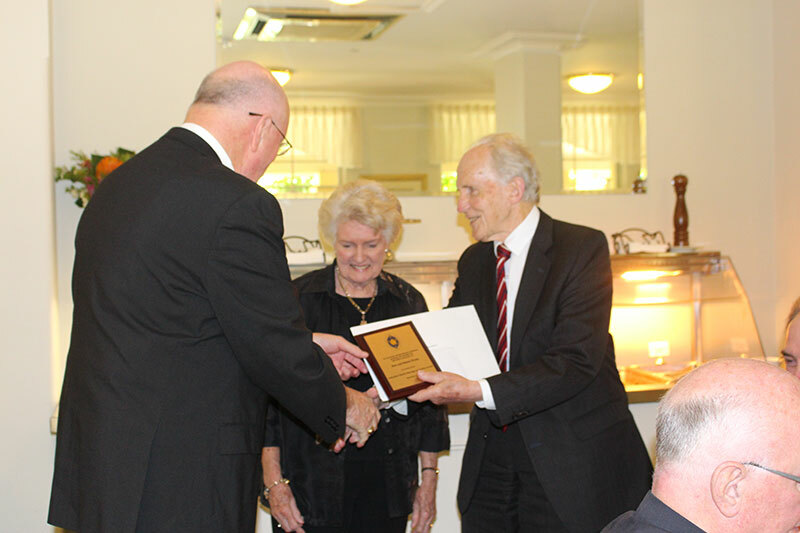 On 25 November, the Australian bishops expressed gratitude to Ron and Mavis Pirola and Kevin and Margaret Andrews for years of dedicated service to the Australian Catholic Marriage and Family Council. 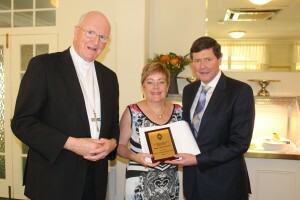 A specially commissioned plaque was presented to both couples from the Australian Catholic Bishops Conference as a token of appreciation for their contribution to the Council. 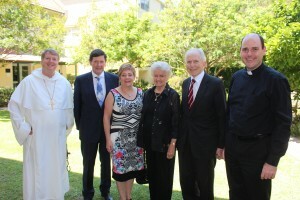 L-R: Archbishop Fisher, Kevin and Margaret Andrews, Mavis and Ron Pirola and Bishop Kennedy following the farewell luncheon recently. Archbishop Hart told those present at the luncheon, ‘Ron and Mavis Pirola attended the Synod on the family with me last year as auditors’. Most recently, Ron and Mavis organised the Australian Pilgrimages to World Meetings of Families and were lay leaders for the previous seven Meetings. ‘Following the World Meeting of Families in 1997, the returning delegate couples formed a self-funded body, called Evangelisation through the Family Group. This subsequently became the Australian Catholic Marriage & Family Council. It retained the guiding concept that the family is one of the Church’s main evangelising resources,’ Archbishop Hart explained. Having finished their maximum of three terms as Chair Couple of the ACMFC, Ron and Mavis said they are looking forward to continuing their work in family ministry. Kevin and Margaret Andrews were also members of the Evangelisation through the Family Group and subsequently the Australian Catholic Marriage and Family Council. Married for 36 years, the couple have five children and three grandchildren. Archbishop Hart said, ‘the couple were founding members of the Marriage Education Programme in Melbourne in 1980, which has provided marriage education courses for more than 20,000 couples since it was founded’. Margaret was editor of Threshold magazine for 25 years and Kevin has served as a Consultor to the Pontifical Council for the Family for over a decade. Kevin is the author of a recent book, Maybe ‘I do’ – Modern marriage and the pursuit of happiness. The President of the Bishops Conference said, ‘as a Member of Parliament since 1991, Kevin has been a strong voice for marriage and family’. Archbishop Hart said he looked forward to meeting the newly appointed councilors who will commence their roles in early 2016. The couples include: Matthew and Nerida Woodbury, Diocese of Broken Bay, Shawn and Branka van der Linden, Archdiocese of Canberra-Goulburn, Luke and Madonna McLindon, Archdiocese of Brisbane, and Matt and Cathy Bourke, Diocese of Darwin and ACBC Delegate Couple to the World Meeting of Families in 2015.